Welcome to our new website feature with an interview with a HousePaws staff member! 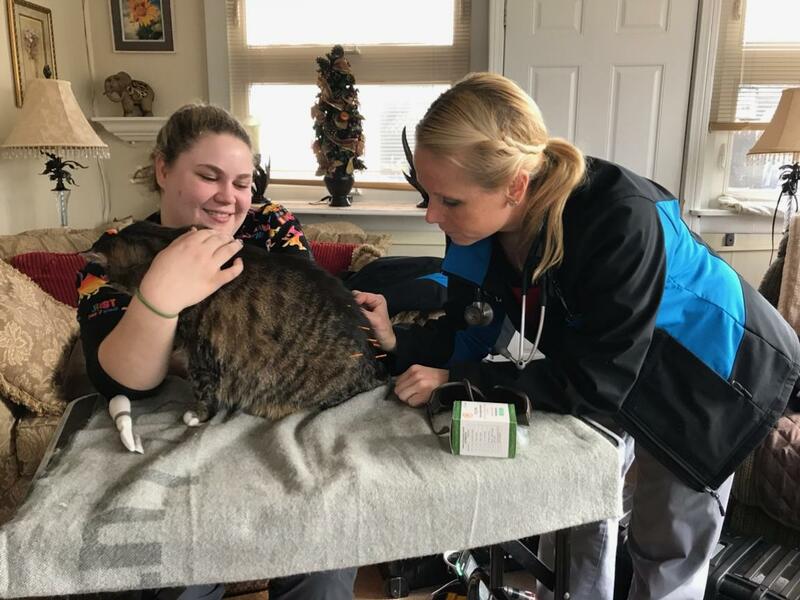 You’ll get to know one of our doctors, techs or administrative staff a bit better, and also get to know some helpful, behind the scenes information about our practice and veterinary care, in general. Our first One-on-One interview is with Dr Dana Koch, the medical director of our Morrisville Hospital who has recently become a certified acupuncturist. Q: Dr Dana, you recently completed the certification for Certified Veterinary Acupuncturist. What was involved in this training process–time, development of skill set, testing, etc. and what credentials do you now have as a result of this training? You practiced acupuncture prior to this training–what did you gain from the certification process? A: I studied at the Chi Institute in Reddick, Florida which was founded by Dr. Huisheng Xie in 1998. His mission was to train veterinarians in Chinese acupuncture, herbal medicine, food therapy and Tui-na. 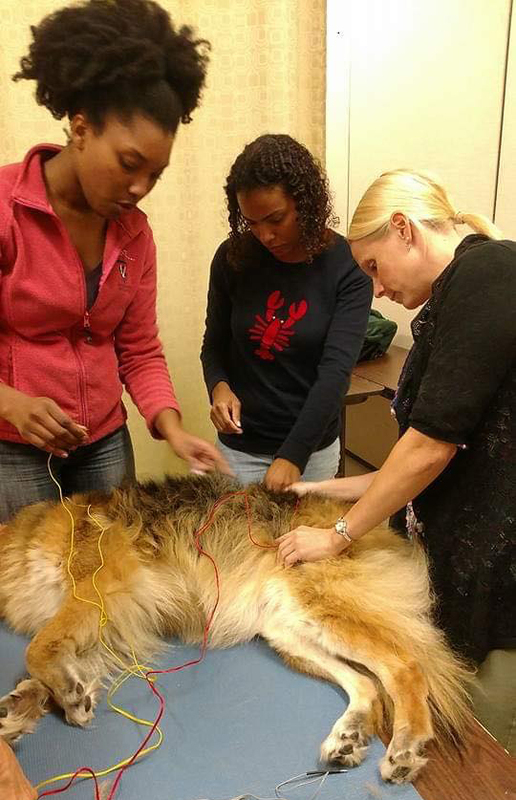 The Chi Institute Veterinary Acupuncture courses not only certify students in veterinary acupuncture, but also offers a comprehensive foundation in the theories and principles behind Traditional Chinese Veterinary Medicine. The course takes place over five sessions: two on-line and three on-site. These courses are available in three kinds of veterinary practice: small animal, equine and mixed animal. I completed the small animal medicine program which is a 150-hour continuing education course approved by American Association of Veterinary State Boards Registry of Approved Continuing Education (AAVSB RACE). The course began with an overview of fundamental aspects of Chinese Medicine, including Yin-Yang and Five Elements theory, which serve as a foundation for case diagnoses and treatment presented later in the class. A variety of acupuncture techniques were taught, including electro-acupuncture and moxibustion, in addition to conventional “dry” needling. In addition to completing all the classroom work and laboratory work I had to pass two examinations and a comprehensive case study on a live animal case. This case study had to approved by the TCVM institute before I received my official certification. The training was very extensive and allowed me to gain a comprehensive understanding of the way in which acupuncture, as well as herbal medicine can benefit my patients. 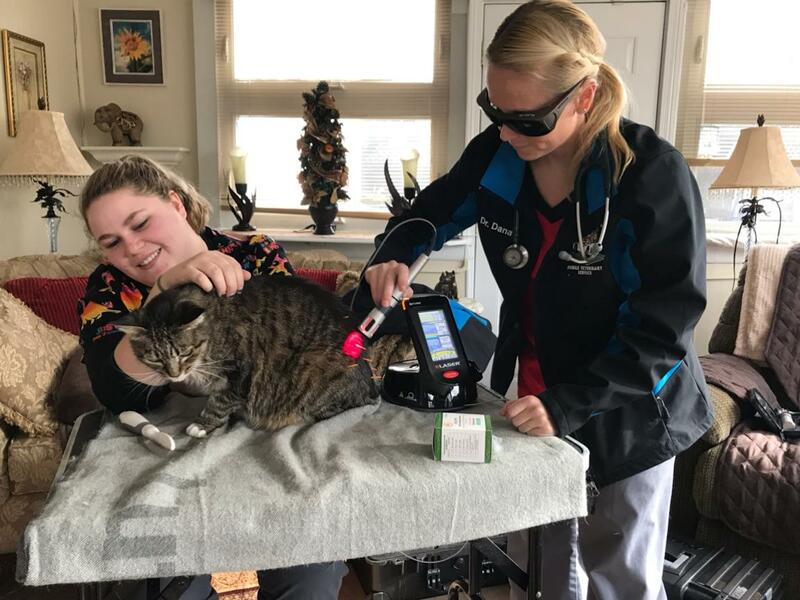 I am thankful to have gained another effective skill to add to my veterinary toolbox, which assists me in improving the lives of animals I work with on a daily basis. Q: How long have you been practicing acupuncture as a veterinarian? What made you consider adding it as a means of treatment in the first place? A: I have been practicing acupuncture for over a year now and have utilized these skills to help many patients with various conditions including acute and chronic injuries, allergies, anxiety, and neurologic conditions. 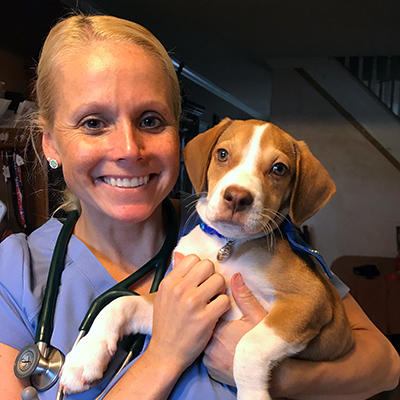 The reason I was interested in studying acupuncture was because Dr. Lisa Aumiller, the fearless leader and owner of HousePaws was already using Chinese medicine in her daily practices. I would see the true benefit it gave to many patients and wanted to offer this to my own patients. Q: Do you find acupuncture effective for specific conditions or is it used for general health? It is used by itself or with other treatments/procedures? A: Acupuncture has actually been around for thousands of years! It originated in China and traditional Chinese veterinary medicine not only includes the practice of acupuncture but also herbal medicine, food therapy, and Tui-na (medical manipulation). There exists approximately 173 acupoints in animals and 361 in humans. Acupuncture generally involves the insertion of thin sterile needles into discrete and specific points on the body in order to cause a therapeutic effect. There are other methods utilized to enhance the effects of acupuncture including electrical stimulation and moxibustion. Moxibustion utilizes dried plant materials called “moxa”, which is burned near the surface of the skin to help with treatment of certain conditions. In terms of the effectiveness of acupuncture there have been several studies that have demonstrated the stimulation of acupoints leads to the release of beta-endorphins, serotonin, and other neurotransmitters. Studies have further indicated that acupuncture can help with pain relief, promotion of tissue healing processes, regulation of gastrointestinal motility, immunoregulation, anti-inflammatory effects and hormone regulation. The best part of acupuncture therapy is that the treatment is extremely safe and rarely causes any side-effects. Some results can be seen immediately, but others will require several treatments. Most animals handle the acupuncture needles very well and often even show a relaxation effect from placement of some of the points. The body has many channels that interconnect and can be stimulated through acupuncture therapy. For many veterinarians that practice acupuncture they are able to use these channels to help many different areas of the body with only a few acupoints. Q: Many people see acupuncture needles and think “that must be painful!” Do the needles hurt? How do animals respond to this type of treatment? Is fear an issue for patients or clients? A: Overall, most of our patients handle the acupuncture needles very well. Insertion of the needles is generally not painful. The acupuncture needles are stimulated using very fine needles, almost as thin as a hair. Some animals may initially be surprised at the placement of the needle but once it is in the desired location these animals rarely show any discomfort. In cases when patients do not appreciate the acupuncture therapy we decide to discontinue that type of treatment and aim for other techniques to help improve their health condition. Q: Are there any cases you’ve work on where you’ve been surprised at the results of acupuncture treatment? A: I have been involved in several cases that I am pleasantly surprised by the effectiveness of acupuncture. 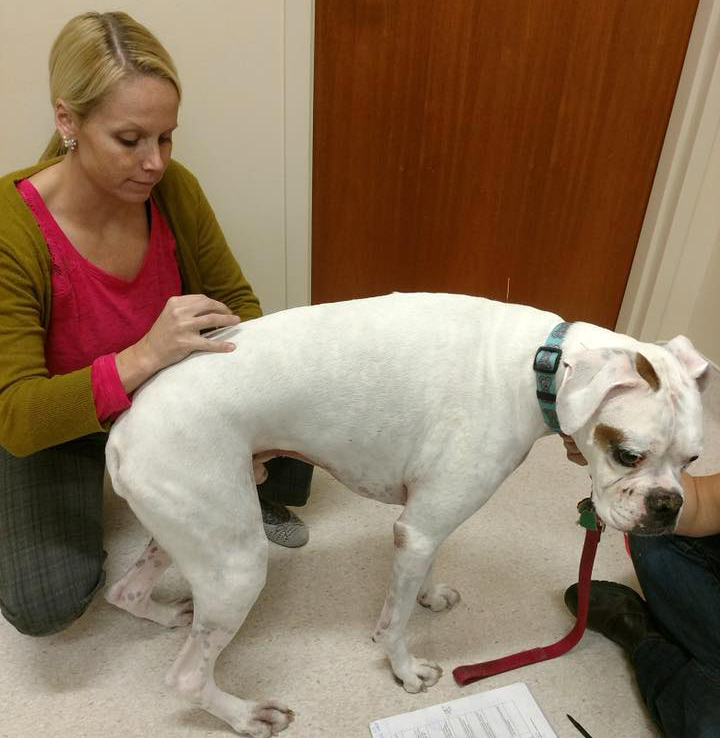 I treat many senior pets with osteoarthritis and for these animals I am using acupuncture to help relieve inflammation, reduce pain, and improve mobility. I have had one or two animals that were unable to be on medications such as anti-inflammatories or traditional pain medications for various gastrointestinal issues and found relief from acupuncture alone. I have also had a few guinea pig cases with neurologic issues, including head tilts and difficulty walking that have responded well to acupuncture therapy. Most recently I helped to treat a young dog with urinary incontinence over the course of four acupuncture sessions. Photos below (click to advance). Dr Dana uses acupuncture for a variety of conditions. Acupuncture can be used by iteself or with other technologies such as cold laser treatment and electrical stimulation. Many pets are not even aware that the treatment is happening.